The Mosel is one of the most romantic and tourist friendly wine regions in Germany. The regions wine and local cuisine can be sampled at one of the many Besenwirtschaften found along the Mosel. You can recognize them by the broom hanging in front of the shop. Many think that wines from the Reisling grape reach perfection in the soft bends of the Mosel. The steep, slaty hills nestle wine growing villages, home to some of Germany's most famous vineyards -- located from the ancient Roman city of Trier with it's Porta Nigra. to Koblenz where the Mosel meets the Rhine. . 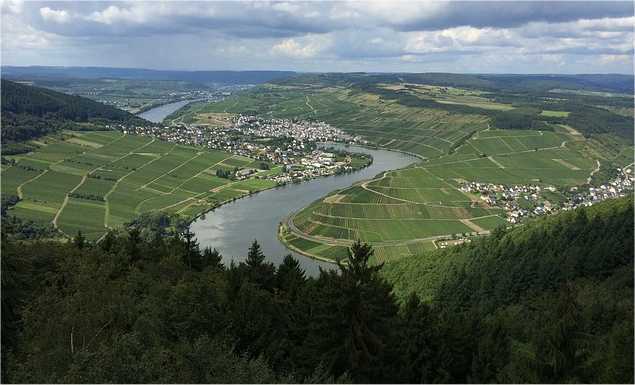 The wines of the Mosel and the smaller rivers that join it, the Saar and the Ruwer, are pale and light bodied. The fruity fragrance as the green bottles are opened and the wine poured into your glass, advertises the lively, fruity acidity of these wines. The minerals, slate composition and the rivers add their personalities to the grapes as they grow. Vineyards trail down gentle slopes around a river bend on the Mosel. Mosel wines have been described as ranging from fine-fruity to earthy, or "flinty". The villages of Wiltingen and Scharzhofberg in the Saar-Ruwer district and Bernkastel, Piesport, Wehlen, Brauneberg, Graach, Zeltingen and Erden in the Middle Mosel district are recognized as the best areas for Mosel wines. Mosel-Saar-Ruwer - The official German Wines site offers an overview of the region with a map of the villages and information on the grapes, the soil and the tastes you can expect to find in the wines of the region. J J Prum - Profile & Wine Tasting Notes - The tasting notes here wax poetic over a Graacher Himmelreich and two Wehlener Sonnenuhr wines - an Auslese and a Spätlese. There are other Mosel wines and vineyards reviewed on the Wine Doctor site, on the site map look for Mosel. Mosel (wine region) Wikipedia - The online information source does a great job in detailing the history, terroir, and the wines of the region with copious photos, related references and resources.